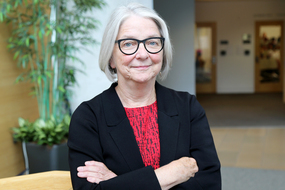 Joanne Nicholson, Ph.D., is Professor in the Institute for Behavioral Health and a clinical and research psychologist with over 25 years of experience working with parents with serious mental illnesses and their families. She is Adjunct Professor of Psychiatry at the University of Massachusetts Medical School. Nicholson has an active program of research on parents and their children, in partnership with people in recovery. She and her collaborators have developed rehabilitation education and training programs and materials for parents, integrating the current knowledge on parents with serious mental illnesses and evaluating interventions for families, including the pilot Family Options intervention and, more recently, the ParentingWell initiative in Massachusetts, USA. Nicholson and colleagues are exploiting emerging technologies on behalf of individuals with serious mental illnesses, developing and testing the WorkingWell mobile app to provide support for individuals in the workplace. Nicholson has provided training and consultation to local, regional, and national organizations such as the National Alliance for the Mentally Ill, the Manic Depressive/ Depressive Association, Mental Health America, Families for Depression Awareness, the Institute on Family-Centered Care, and the Child Welfare League of America. She has visited parents and programs around the world as a consultant and trainer, providing keynote presentations and working together with national and international groups in Australia, The Netherlands, Spain, Norway, New Zealand, Northern Ireland, Austria and provinces across Canada. Nicholson and her colleagues published the first guide for parents living with mental illness written by parents, Parenting Well When You’re Depressed and a guide for professionals written by professionals, Creating Options for Family Recovery: A Provider’s Guide to Promoting Parental Mental Health. She has published over 100 papers and original articles in professional journals and edited volumes, as well as provided interviews for newspapers, magazines and radio in the U.S. and other countries, and has been an invited contributor to the Huffington Post. Nicholson has received funding from the National Institute on Disability, Independent Living, and Rehabilitation Research, the Substance Abuse and Mental Health Services Administration (SAMHSA), the National Alliance for Mental Illness Research Institute, the National Institute on Drug Abuse, the National Library of Medicine, PCORI, private foundations and industry sources. She is an Advisory Group member and consultant to numerous research initiatives and community-based organizations serving parents and families in the U.S. and abroad. Foster, K., Goodyear, M., Grant, A., Weimand, B. & Nicholson, J. "Family-focused practice with EASE: A practice framework for strengthening relational recovery when mental health consumers are parents." International Journal of Mental Health Nursing 28. 1 (2019): 351-360. Nicholson, J. & English, K. The ParentingWell Practice Profile. Waltham, MA: National Research Center for Parents with Disabilities, Brandeis University and the Massachusetts Department of Mental Health, 2019. Nicholson, J. & English, K. The ParentingWell Workbook. Waltham, MA: National Research Center for Parents with Disabilities, Brandeis University and the Massachusetts Department of Mental Health, 2019. Nicholson, J. & Valentine, A. "Key informants specify core elements of peer supports for parents with serious mental illness." Front. Psychiatry 10. (2019): 106. Powell, R. & Nicholson, J. "Commentary: Disparities in child protective services." Psychiatric Services 70. 3 (2019): 209-210. Nicholson, J. & Valentine, A. "Defining “Peerness”: Developing peer supports for parents with mental illnesses." Psychiatric Rehabilitation Journal 41. 2 (2018): 157-159. Nicholson, J., Wright, S., Carlisle, A., Sweeney, M.A. & McHugo, G. J. "The WorkingWell Smartphone App for Individuals with Serious Mental Illnesses: Proof-of-Concept, Mixed Methods Feasibility Study." JMIR Mental Health 5. 4 (2018): e11383. Sonik, R.A., Parish, S.L., Mitra, M., & Nicholson, J. "Material hardship and program participation among parents with and without disabilities." Review of Disability Studies: An International Journal 14. 4 (2018).